HOUSTON (CN) – A federal judge on Tuesday denied the Federal Emergency Management Agency’s request to stay a lawsuit brought by three hurricane-damaged Texas churches who are challenging the agency’s policy of denying disaster relief to houses of worship. Congregations throughout the United States are keeping close tabs on the lawsuit as church leaders from Florida to Puerto Rico and Texas dig out from the rubble left over by a devastating hurricane season, wondering why they can’t get disaster-relief funding from FEMA but other nonprofits can. U.S. Justice Department attorney Kari D’Ottavio, representing FEMA via telephone before U.S. District Judge Keith Ellison, urged the judge to stay the case for 60 days at a hearing Tuesday. She said the agency’s policy on disaster aid to churches is currently on hold and is not being enforced. “FEMA is undertaking a comprehensive review of those policies and we think the case should be stayed,” she said. The plaintiff churches — Harvest Family Church, Hi-Way Tabernacle and Rockport First Assembly of God — were damaged by Hurricane Harvey in August. They sued FEMA on Sept. 4, claiming its ban on aid to faith-based organizations violates the First Amendment. The churches are represented by Becket, a Washington, D.C.-based religious advocacy law firm. Despite D’Ottavio’s claims during the hearing that FEMA had not denied any of the plaintiffs’ requests for aid, Becket attorney Daniel Blomberg said the agency denied Rockport First Assembly of God’s request for expedited public assistance on Oct. 3. Harvey blew off the church’s steeple, opening up a hole in its roof, when it made landfall near Rockport on Aug. 25, Blomberg said. He said FEMA has already paid out around $470 million to Harvey victims in Texas, and his clients are worried that FEMA will run out of money at some point. “Officials administering this program say early bird gets the worm,” Blomberg said. The churches have asked Judge Ellison for a preliminary injunction to allow them to apply for the aid. Under FEMA’s policies, disaster-relief grants can be awarded to schools, nursing homes and hospitals affiliated with religious groups, and church-run community centers, but only if less than 50 percent of their space is used for religious purposes. 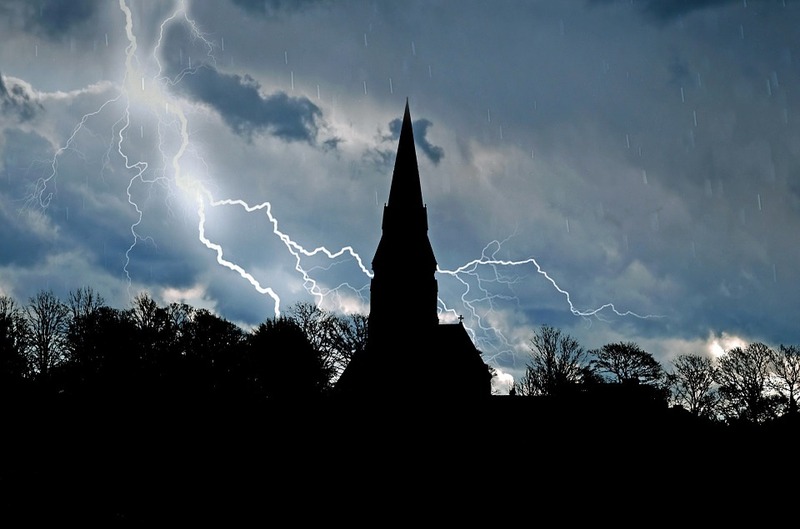 Though Ellison expressed sympathy for the harm done to congregants at the churches who have lost their worship space at a critical time, he said he’s hesitant to grant a preliminary injunction that would have national ramifications. “I’m mindful that unelected judges should be careful about decisions that affect policy,” he said. The judge asked Blomberg if a payment from FEMA could satisfy the plaintiffs. “No. They are discriminating on the basis of First Amendment rights,” Blomberg said. 7-2 ruling in Trinity Lutheran v. Comer, in which the high court held in June that a Lutheran church in Columbia, Mo., had been wrongly denied state grants to resurface its playground because the denial constitutes religious discrimination. Chief Justice John Roberts wrote in the majority opinion that it is “odious to our Constitution” to exclude the church from the grant program solely because it’s a religious organization. “The churches’ primary goal is to undo the odious discriminatory policy that expressly discriminates against them because of their religious affiliation. Such a policy imposes discrimination on the free exercise of religion,” Blomberg told Ellison, who sat at his bench with his hands on his head in his carpeted, almost comfy, courtroom that has a low-slung ceiling and is decorated with Ellison’s collection of abstract paintings. The judge looked up at the speakers in the courtroom’s ceiling, as D’Ottavio explained via speakerphone that even if he enjoins the policy with a preliminary injunction, that doesn’t mean the churches would be eligible for FEMA aid. “They might be deemed ineligible for reasons that have nothing to do with their status as churches or the services they provide. If insurance or a U.S. Small Business Administration loan covers costs of repairs, FEMA wouldn’t provide more funding,” she said. She told Ellison that FEMA and Justice Department officials are making every effort to quickly complete the church-aid policy review process, but couldn’t give him a date when it would be done. “You and I have both seen enough of the government that we know reconsideration can take years,” Ellison replied with a laugh. He pressed D’Ottavio to tell him if the government believes FEMA’s policy should be upheld. “The government hasn’t provided any proof the policy is constitutional. Am I correct?” he asked. But D’Ottavio sidestepped the question. “We are asking that you don’t rule on the preliminary injunction motion and let FEMA redo the policy. And if they don’t like it, they can reapply for a preliminary injunction,” she said. Ellison denied FEMA’s request for a 60-day stay, but did not say when he will rule on the churches’ injunction motion. “This funding has been granted to entities like cephalopod research centers. It’s been provided to community centers and the churches have no problem with that, they would just like to be able to receive that same type of funding as well,” he said. Rabbi Yaakov Menken, managing director of the Coalition for Jewish Values, was upbeat after the hearing. “I was impressed that FEMA’s attorney didn’t try to defend the policy,” he said.